Winter is coming. That means we all need to gain as much weight as possible to stay warm during the winter. That's my theory and I'm sticking to it! So it's time for cheesecake...pumpkin cheesecake! During my pumpkin craving craze I saw a fabulous recipe for pumpkin cheesecake - I wasn't even looking, I swear. Do I need to eat an entire cheesecake by myself? I want to say yes, but I'm pretty sure the answer is no. So I made this to take over to a friend's place where I was headed for dinner. I got to have a slice (or two...) and leave the rest for other people to eat. I cheated as much as possible. 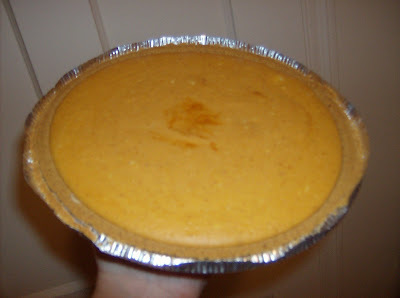 I used a pre-made graham cracker crust and the Libby's easy pumkin pie filling again, so it took almost no time at all. The directions say to bake it for 35-40 mins but I think next time (oh there will be a next time) I will bake it a little longer because it was a little runny making it hard to get out of the pan. I'm already planning to take this to my sister's place for Thanksgiving!